Last month, in Good News from CBMS, I reported on the preliminary student enrollment numbers from the Conference Board of the Mathematical Sciences (CBMS) survey of Mathematics Departments in the United States. This month I will be looking at preliminary data on the distribution of faculty in mathematics departments by status: full-time or part-time, and whether tenured or tenure-eligible. 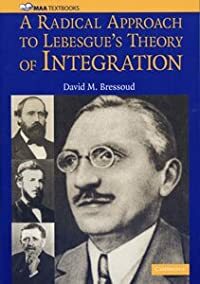 I’ll also look at the distribution of women at the three types of institutions: research universities, comprehensive universities, and undergraduate colleges. As with last month’s numbers, these are preliminary results that are subject to adjustment, but I expect any changes to be minor and that the trends will hold up. 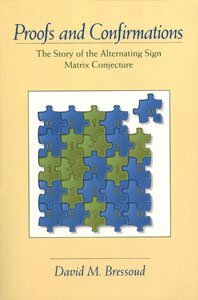 There are two competing pressures that affect the number of faculty positions in mathematics. As we have seen, enrollments at the level of calculus and above are up by over 30% over the past five years. On the other hand, university budgets are severely strained. The good news is that more faculty have been hired and they have been full-time faculty. 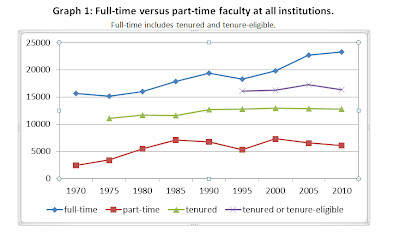 In fact, the number of part-time faculty has decreased over the past five years. The bad news is that the additional faculty positions have been entirely non-tenure-eligible. 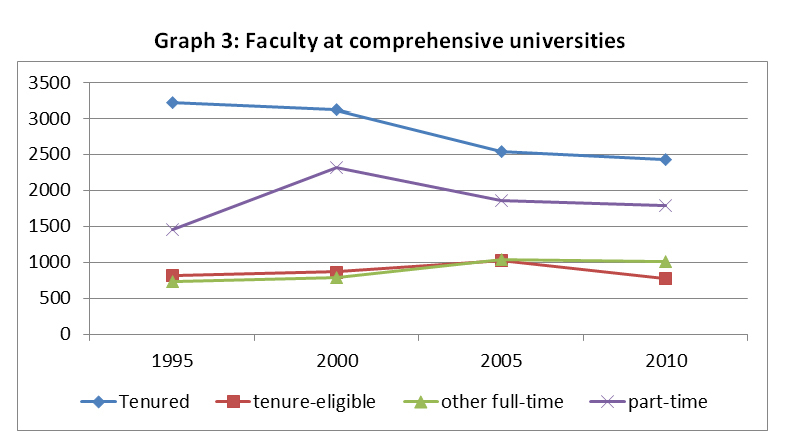 The number of tenured and tenure-eligible faculty declined slightly, from 17,256 to 16,362, over the past five years. 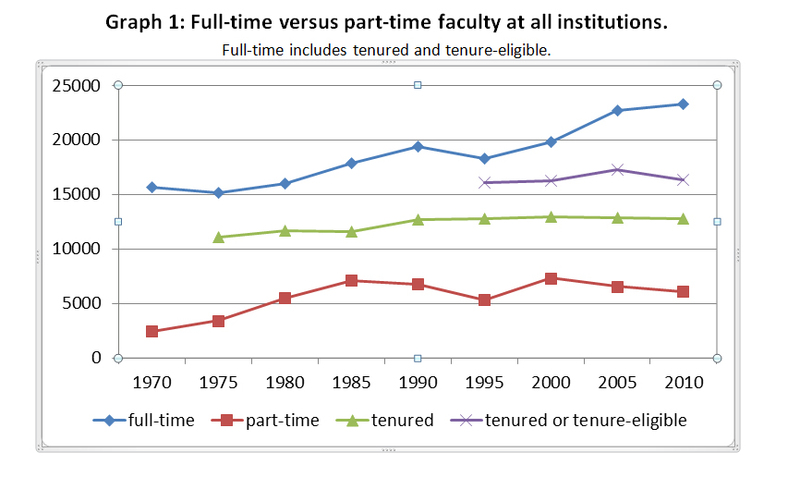 CBMS data on full-time versus part-time employment of faculty in mathematics departments goes back to 1970. 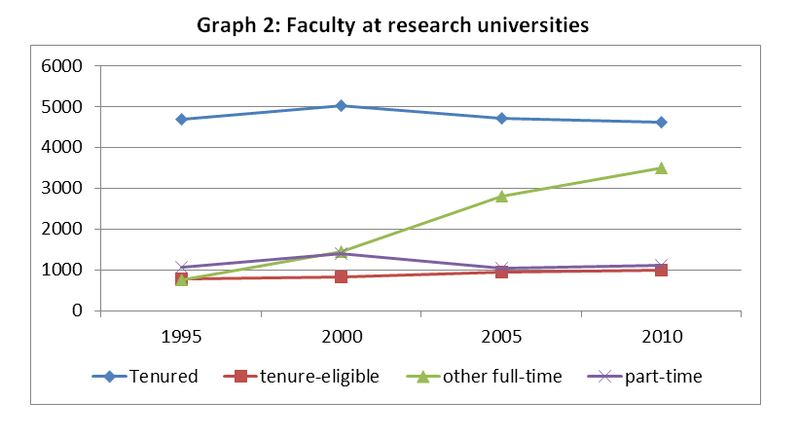 Counting the number of tenured faculty within the ranks of the full-time faculty began in 1975. In 1995, CBMS began to record the number of tenure-eligible faculty. Almost all of the drop in tenured and tenure-eligible faculty from 2005 to 2010 has been in the ranks of the tenure-eligible. The number of tenured positions dropped by only 127, but there was an 18% drop (from 4381 to 3614) in the number of tenure-eligible faculty. As the graph indicates, much of this drop can be attributed to the fact that 2005 was an anomalous year with a large number of tenure-eligible positions. The number of such positions in 1995 and 2000 was around 3300. The data for 2010 seems to reflect a correction back toward these levels. 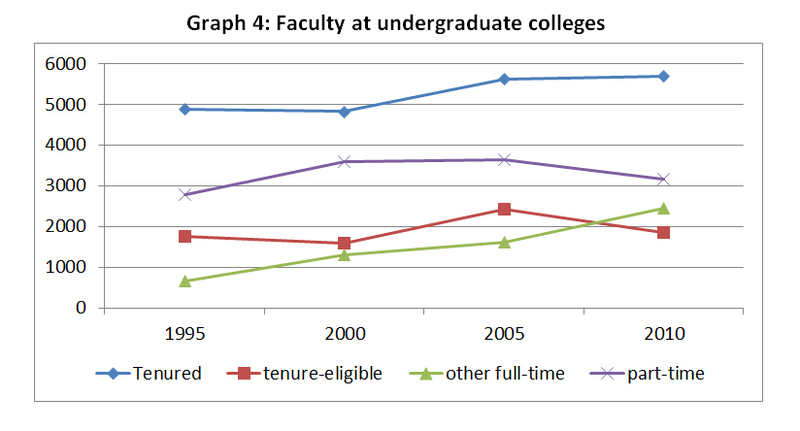 Different types of institutions have seen very different patterns of faculty status since 1995, the first year that CBMS began tracking department responses according to the highest mathematics degree offered: PhD (which I refer to as research universities), Masters (which I categorize as comprehensive universities), or Bachelors (undergraduate colleges). We see that it is especially at the research universities where the growth in non-tenure-eligible full-time faculty has occurred. 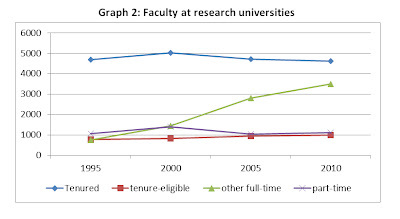 Research universities are also losing their tenured positions. The comprehensive universities have taken the biggest hits across the board. 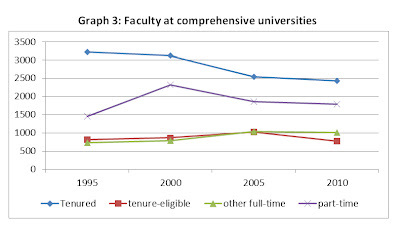 Even though the number of part-time faculty declined here also, they constitute 30% of the faculty positions at the comprehensive universities. 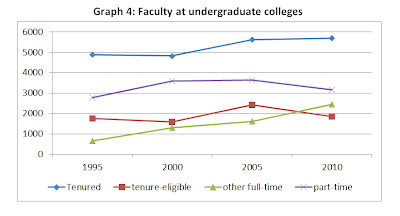 Perhaps the brightest picture is at the undergraduate colleges, though the increase in the number of tenured faculty was more than offset by the decline in the number of faculty in tenure-eligible positions. 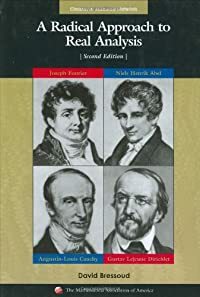 Turning to the number of women, we see that their representation within mathematics faculty has continued to grow and that they are much better represented in undergraduate colleges and comprehensive universities than in research universities. 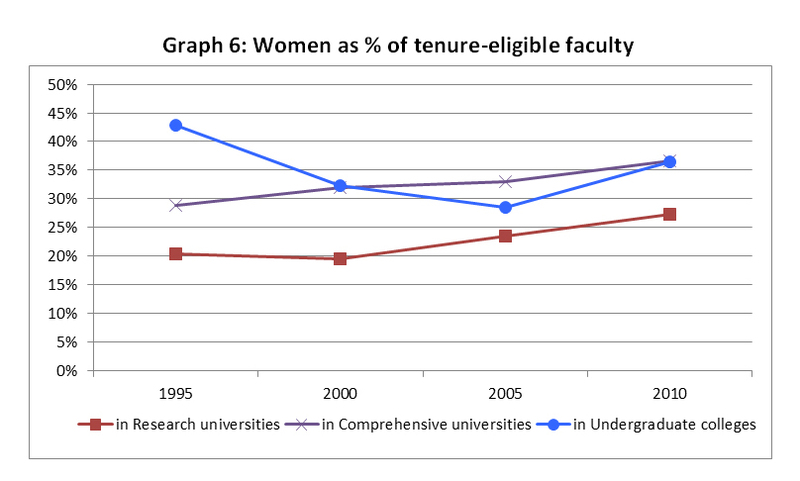 The next graph, women as a percentage of tenure-eligible faculty, shows a sharp decline in their representation at undergraduate colleges from 1995 to 2005. 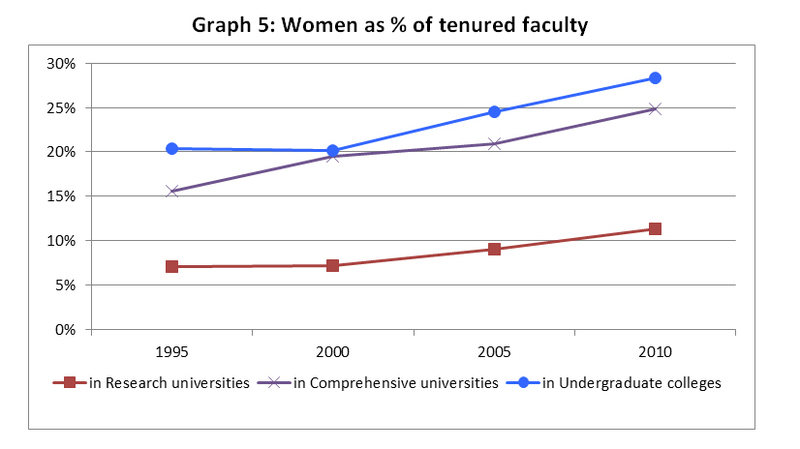 If we look at where women were teaching in 1995, it was predominantly at undergraduate colleges. 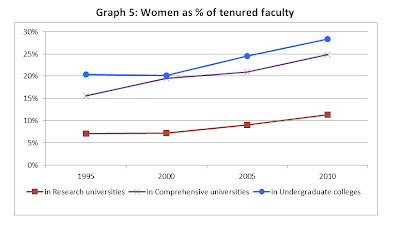 In that year almost 2/3rds of the women in tenure-eligible positions were at undergraduate colleges, compared to 52% of all faculty in tenure-eligible positions. Just five years later, 55% of women in tenure-eligible positions were at undergraduate colleges, where it has stayed since then. 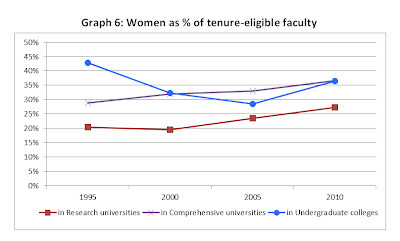 The decrease in women as a percentage of the tenure-eligible faculty at undergraduate colleges appears to be a reflection of increased opportunities at research and comprehensive universities.